For my other posts about woodworking tools, follow this link. For this final post in the A to Z Blogging Challenge, I've chosen something that the readers of this series might wonder at. Both of you are probably asking yourselves what kind of woodworking project is held together with zip-ties. After all, I've talked extensively about Allen head bolts, biscuit joints, quick-set epoxy, and various other means by which different items are secured. But zip-ties? How do they figure in? In a high-level, conceptual sense, zip-ties are a new and easy-to-use replacement for string. Back in the day, every craftsman knew how to tie a couple of dozen different knots, each perfectly suited for the individual purpose at hand. Different kinds of string were well-known, too, with the merits and shortcomings of each taken into consideration when deciding how to secure this or that. Today, such knowledge is a dying art. I like to think that I keep the flame alive with the different types of string I have in my shop and the different knots I know. So much of that knowledge, though, is extinct. Even I will admit that it is often easier and simpler to put a double-wide zip-tie on than it is to get a length of braided polypropylene twine and tie a constrictor knot. Easier and simpler, yes, but better? I'll let posterity be the judge. I use zip-ties to hold the dust collector hoses onto my table saw. I also use zip-ties to bundle up spare lengths of garden hose, baling wire, electrical cable and other loose raw material and tools I don't have call to use very often. Sometimes, I use zip-ties to temporarily secure pieces I'm glueing up. There was a time when I had some old tools that were held together with a carefully positioned zip-tie. Fortunately, I've been upgrading my tools long enough that all of those old pieces of junk have been relegated to the trash or to the spare parts bin. I still have some file and rasp handles that are held together with bound and wrapped wire, but that's completely different, for a lot of reasons which I can't seem to think of right now. Zip-ties are good, but they shouldn't be relied on for anything too stressful or important. If you over-tighten them, the securing wedge snaps off, or the plastic strap itself will break. For something that's going to be held in place for a while, it's better to use five or six zip-ties set at different angles, each secured snug, than to use one big one ratcheted down tight. Also, zip-ties deteriorate over time, particularly in applications where they are exposed to hot water. (Don't ask me how I know about THAT one. Jeez, what a mess.) Sunlight chews them up like ants on a sugar cube, since the plastic is UV sensitive. After a while they just shatter. I have zip-ties, natural fiber strings, man-made fiber twines (twisted and braided), bare and plastic-coated wire, straps, ropes and cables, all of them in different gauges and materials. The decision to use one vs. another depends on the workpiece, the intended usage, expected conditions under which it has to function, how long it's intended to stay tied together and a bunch of other factors. 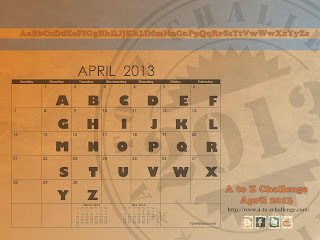 Oh dear... this final A to Z Blogging Challenge post wasn't really about zip-ties at all, was it? It ended up being all about the entire class of tool that zip-ties represent, and the subtleties that go into judiciously using this or that member of this class of tool so as to do a job right. Ultimately, this post was about the knowledge and skill that go into being an artisan. It was a bit of nuts-and-bolts technical information couched in a geeky celebration of the diversity of tools and techniques available for any given job. That's quite a fitting way to end this series, don't you think? Zip ties are a gift from above. I always keep a handful in the little storage container on my motorcycle, mostly in case I run across someone on the road who needs a temporary fastener. I have bungies & rope in my car for the same reason. These two comments can be taken quite differently, if you infer "run across" to have a different meaning. Just make sure you hide the bodies well. It rambled itself off a cliff, which I think is the most appropriate way this month at Home Depot ought to have ended. Yes, fitting. Yes, funny. Congratulations, Tony! And I remember the first time I saw police zip-tying people's hands. Freaked me out. I thought about including the "civil unrest" application for zip-ties, but decided it was too far off-topic.